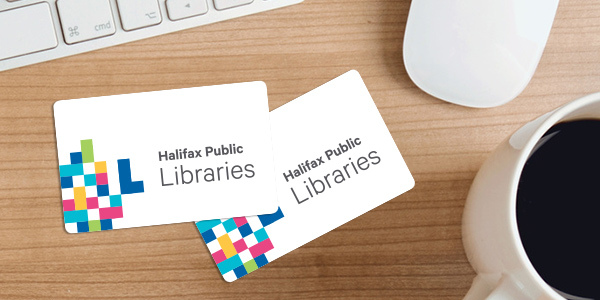 If you’re a resident of Nova Scotia, you can get a Halifax Public Libraries card for free. Your library card is your passport to our collections. You can borrow items, use our computers and other devices, and access our digital collections from home. Need a replacement card? If your library card is lost or stolen, you should let us know immediately. You'll need 2 pieces of identification. For example, a driver's license. If you're under 14, an adult (age 19 or older) needs to sign for you and they'll be responsible for what you borrow. You and the responsible adult will both need one piece of identification. If you don’t have the necessary identification or don't live in Nova Scotia, you may be able to get a different type of library card. Visit any of our locations and bring your identification. We will set up your account and you can start borrowing on the same day! Fill in the form below and click on the ‘Get a Card’ button. We’ll mail your library card to you. Once you've received your card, you'll need to visit one of our locations to present your identification. If you provide us with an email address, we'll send you an email with your library card number. You can use your library card number to create an account on our website and access our digital collections. This form is only for residents of Nova Scotia. If you provide an email, we'll send your library card number within 24 hours. Once you register your library card number on our website, you will be able to access our online resources. I am the parent or legal guardian of the above named applicant and I hereby apply for borrowing privileges on his/her behalf. I understand that I am responsible for my child's use of any Halifax Public Libraries' services or facilities, including the borrowing of materials and the use of Library computers and the Internet. I agree to abide by the rules and regulations of Halifax Public Libraries and to take full responsibility for materials borrowed on this card. I hereby apply for borrowing privileges at all Halifax Public Libraries branches. I agree to be responsible for the materials borrowed on my library card and to abide by the rules and regulations of Halifax Public Libraries.